Businesses in the automotive industry should have stationary that reflects the fine engineering required in the industry. This is why our F1 autogroup template is so appropriate. The 0.5mm thick black metal stock is a product of fine engineering. 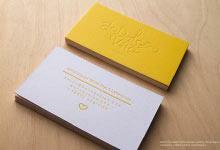 With rounded corners this business card stands out not only in material, but in shape as well. Etching is used to create the logo on the front and leaves a recessed look which is paired with etching and red spot color alongside the logo to add a bold pop of red and a subtle splash of gray. The back of the design also uses etching and gray spot color to provide a sleek way to present your contact information. Prism finishing has been added to the back of the card to create a fingerprint resistant pattern that adds to the luxuriousness of this card. 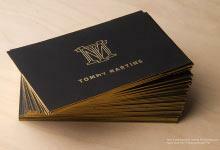 Our Black luxury Metal Cards are with out a doubt a show stopper. On our ultra thick 0.5mm thick black anodized stainless steel metal these cards are the perfect way to depict your success. Available in both frost and prism finish these finger print resistant cards make perfect VIP membership cards and can be combined with etching and spot colour. Custom die cut, non-bleed etching and frost or prism finish are all specifications that are included in the base price of this card.